There’s a lot of downsizing happening in Ottawa’s real estate market right now. As such, we’re moving more and more people from big homes into not-so-big homes. If you’re planning on moving into a smaller house, these tips are for you. One of the hardest parts of moving into a smaller house is dealing with the loss of space. This differs from person to person, especially if you’ve spent most of your life living in larger homes. We recommend focusing on the positives: smaller homes are easier to keep clean, which means less time and money spent on the house. That means more time and more money for other (more fun) things. You may be choosing to live in a smaller space so you can have that great neighbourhood. If you’re someone who likes to stay active, focus on all the amenities that will be close by, and how convenient it will be! Did You Know? Fewer Belongings Can Actually Make You Happier! Recent studies have shown that when you spend money on experiences instead of things, you’re actually happier. According to psychologists, many of us suffer from hedonistic adaptation. Basically, we get used to our belongings, and after a short period of time they no longer bring us joy (more on that further down the page). But when we’re doing something – vacationing, dining out, going on adventures – we’re forming lasting, positive memories that fuel happiness. Doing things also promotes more social interaction, which is linked to happiness. Moving into a smaller home is the perfect time to shift your focus on having less and doing more. We tend to expand our belongings to fit the available space. However, it takes a lot more work to contract (or cut down) on belongings when that space gets smaller. We have a few tips on ways to declutter, but we’re also huge fans of this little thing called the KonMari method. 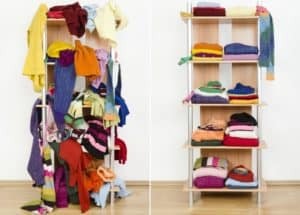 This decluttering method was started by a woman named Marie Kondo and her book The Life Changing Magic of Tidying: A Simple, Effective Way to Banish Clutter Forever. Now it’s a Netflix show with a huge following that has sparked a wave of decluttering across North America. It sounds pretty easy, but it’s actually really hard – especially if (like many people) you get nostalgic. But it’s also incredibly cleansing, and will definitely make moving to a smaller home a breeze. While we highly recommend you binge-watch her show and read about her work, here are a few of our favourite decluttering tips from Marie Kondo. Commit to tidying/decluttering. Marie does not believe in ‘tidying here and there.’ If you’re going to declutter, you’re going to invest serious time into the process. Test the Joy-O-Meter. We love the ‘spark joy’ concept. It gives you something more concrete to work with, plus it encourages you to interact with all your belongings. Don’t tidy by room. Marie recommends decluttering by category instead of by room: for example, do all clothes before moving onto something else. Store things vertically. This is something a lot of home professionals swear by: storing everything from T-shirts to your condiments vertically so everything is visible, easy to grab, and easy to keep organized. Remember: Decluttering – no matter what method you use – is a big process, so it’s important to start well before your moving date. Another thing that can dictate how many belongings you hold onto is the storage situation in your new home. While now you may have 2 linen closets, you might only have 1 when you move. There are a couple ways you can approach this conundrum. 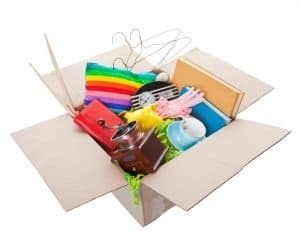 First, you can cut back even more on your belongings – but you should only do that if you feel there’s more you could purge. You don’t want to get rid of things you need or love. Any furniture with built-in storage! Multi-purpose things are definitely your friend when moving into a smaller house. Do not skip this step! Moving into a smaller house generally means smaller rooms with different dimensions. Furniture that worked in your large home may be either too big for the space or not fit at all. You’ll want to know this before you pack it up and move it over. We recommend measuring the height, width and depth of all the furniture you’re not sure about. Write down those measurements, then (if you can), get the room measurements for your new house. This will save you a lot of hassle down the road. Packing can be challenging and time-consuming, especially when you don’t know where to start. To that effect, we’ve crafted several how-to guides on the best ways to pack like the professionals here at Cassidy’s. 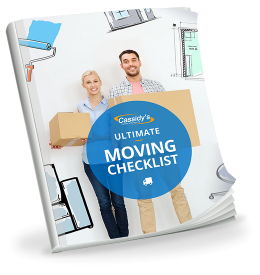 You can view all of our guides here: we have packing tips for everything from clothes to books to the most fragile items! Don’t have the time to pack, or want the convenience of having professional help? Cassidy’s has a team of expert packers that can do as much or as little as you want. Cassidy’s has been moving for over 100 years. With that kind of expertise, we can make your move easy and stress-free, so you can focus on this exciting new milestone. If you're drowning in your own possessions, help is here! Learn how to tell if you have too many things, and if you do, how to start down the road to recovery. We’ve finally done it - we’ve found the clutter solutions you absolutely need. We’re sharing how to tackle it, where to take it, and how good it feels when you move without all the excess packing. Tired of the clutter and never having a tidy home? Cut through it all with these 5 simple tips to a mess-free life. You’ll feel better almost instantly - and you can even make it fun for your family.